Jackson, a college teammate of Brett Favre, was chosen by the Browns in the sixth round of the 1991 NFL draft thanks to a recommendation from ex-Cleveland star TE Ozzie Newsome. He started seven games as a rookie and caught 17 passes for 268 yards, impressing with his height and speed but lacking in refinement. Jackson improved to a team-leading 47 catches for 755 yards (16.1 avg.) and seven touchdowns in ‘92 and followed up with 756 yards on 41 receptions for an 18.4-yard average and eight TDs in 1993. 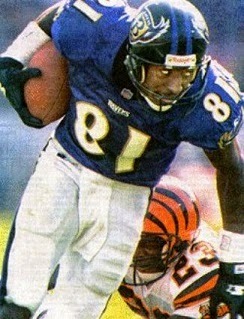 A hamstring injury limited him to nine games in 1994, but he bounced back in ’95 with 44 catches for 714 yards (16.2 avg.) and nine touchdowns in an otherwise down season for the team. The franchise moved to Baltimore and was re-named the Ravens for 1996 (with the Cleveland Browns name and history staying behind). Ravens went 4-12 to finish fifth in the AFC Central although ranking second in the NFL in passing yards (3978) and first in the conference in TD passes (34). Jackson followed up on his outstanding 1996 season by catching 69 passes for 918 yards (13.3 avg.) and four touchdowns in ’97, slowed by nagging injuries and affected by the offense becoming more ground-oriented. Further injuries limited him to 38 receptions for 477 yards and no TDs in 13 games in 1998, in what was his last season. After failing to catch on as a free agent with Seattle, he retired. Overall, Jackson caught 353 passes for 5393 yards (15.3 avg.) and 46 TDs over the course of eight years with the Browns and Ravens.